A story of a relationship between the orca Morgan, rescued in the Netherlands, and Miranda Theunissen, a native Dutch, is far from ordinary. Suffering from severe health issues (she is completely deaf and has severe eyesight problems), Miranda is returning in full spirits to Loro Parque for the sixth time now to be able to visit the orca Morgan, having established a strong connection to the animal. Loro Parque, a renowned zoological park most recently recognized in the TripAdvisor’s Travellers’ Choice Awards as the best Zoo in the World, has been home to Morgan since 2011. Miranda first met Morgan more than seven years ago now at Harderwijk Dolphinarium, shortly after she had been rescued in a shallow area off the Wadden Sea coast. From the very first time Miranda saw Morgan, she knew they had a special connection and they became very attached to each other, which marked the beginning of a beautiful friendship. Miranda visited Morgan 88 times while she was staying in the Dutch Dolphinarium, and spent long hours accompanying her and assured having bonded strongly to her. Miranda recalls that while she was visiting Morgan during her recovery stay at Harderwijk Dolphinarium, that they both could communicate with each other using eye contact and signs, and Morgan stayed close most of the time when Miranda was around. From the pool, she played with her, dived and danced to have Miranda’s attention, and she even offered Miranda her own fish. Miranda noticed Morgan was always sad when she left on her first visits, but she soon learned that Miranda would always come back, so she got used to the routine of seeing her often. Miranda saw Morgan getting better and gaining weight. Right from the start Miranda knew, that Morgan would not be able to stay in Harderwijk Dolphinarium for long. Their facilities were simply not adapted for an animal like her. It was in July 2011 when the Netherland’s Government made the decision of transferring Morgan to Loro Parque, as it was considered an ideal place where she could integrate with other orcas that already were receiving optimal care. On the other hand, the park also had strong demonstrated accomplishments on research, education and raising awareness about the conservation of biodiversity and protection of the natural habitats. Miranda definitely felt so happy when she knew Morgan was being transferred, but also slightly sad at the same time, as she would not be able to see her as often. 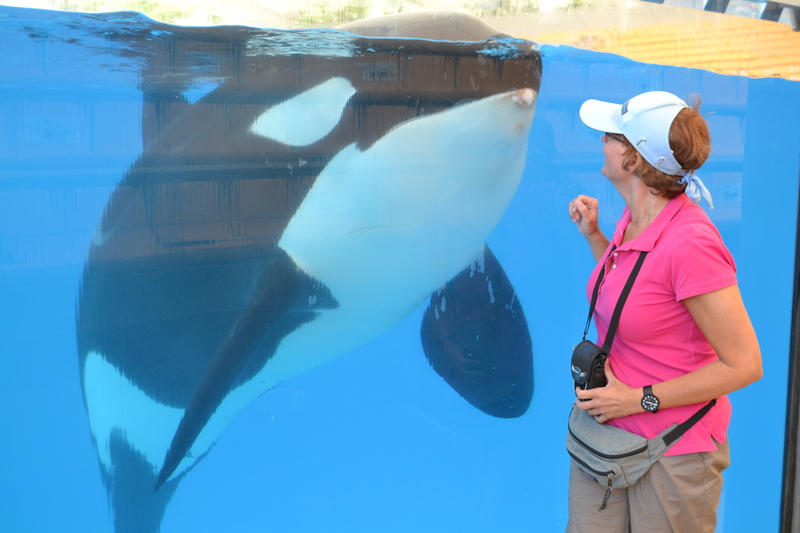 Soon enough, however, Miranda was able to start visiting Morgan in Loro Parque. This year marks the sixth time that she has been in the Park. When Miranda saw Morgan for the first time in Loro Parque, it was an emotional moment, for Miranda and for everybody who was present. She says Morgan, acted as if at first she could not believe it was Miranda. 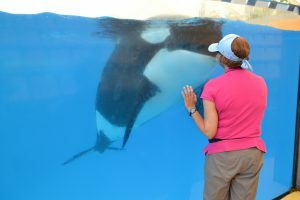 Then later, she would closely follow Miranda the entire time and even imitate her movements, a demonstrated bond between a deaf orca and a deaf Dutch woman that brought them together. During this most recent trip, Miranda visited the park every day and she did not miss one single orca show. She sees Morgan extremely happy with her fellow orcas at Loro Parque, and she promises to come back every year, her vision permitting. 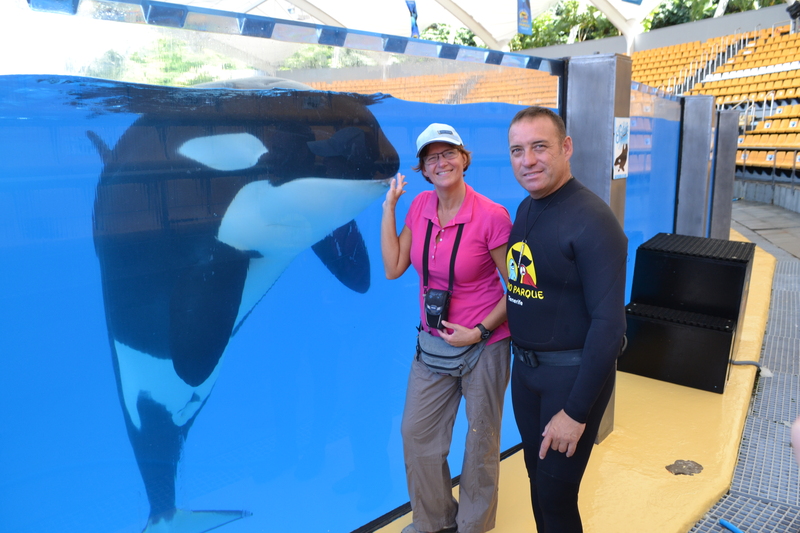 Miranda ensures all trainers at Orca Ocean and the whole Loro Parque family should feel very proud of the work they are doing, because Morgan could not be in a better place, and she really does look different to when she appeared in Wadden Sea. She is now happy, Miranda says, and that is why she can happily go back to the Netherlands, because she knows her friend is exactly where she needs to be.